This is truly a classic within the sci-fi genre and without a doubt a must-see if you are into anything near androids, self aware robots or robotic ethics. 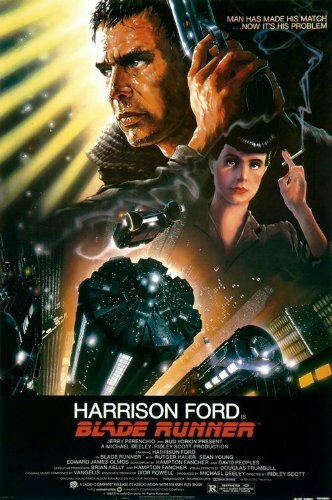 I recently read the book “Do Androids Dream of Electric Sheep?”, which this movie is based on, and though part of the plot from the book is reused, a significant large part i left out. This is not all bad though as I think the movie works well as a movie and also some of the parts in the book maybe should have been cut as well. The big discrepancy between book and movie might mean that you might not like the book despite loving the movie. I do however think that you should give it a try anyway. It is an exciting book as well! Except from being an exciting movie with a relevant topic, I think that one of the reasons why I got excited when watching this movie is that I have actually been at two of the key locations where the movie is filmed. Deckers apartment is actually a house designed by the architect Frank Lloyd Wright placed on top of a hill with a fantastic view over Los Angeles and the Hollywood sign. For a small fee you can get a guided tour through the building (with a focus on the architecture, not the movie set though!). The other location I have been to is the Bradbury Building in downtown Los Angeles. As far as I remember, you can gain access to the main hall with the fantastic stairs and elevators for free. The performance delivered by Harrison Ford is a solid reluctant hero. He does a good job for a big star. The crew playing the androids is very varyings in quality, but then again how does one play an android? How does a machine that only recently discovered that is was a machine react in a real people world? I think I would prefer a performance combined of what is delivered by Sean Young (playing Rachel) and Daryl Hannah (playing Pris). Their way of expressing emotions and confusion about them seems realistic for a self aware android. Brion James’ character Leon seems a bit too retarded and Rutger Hauer playing Roy becomes too theatrical at the ind in my opinion. The movies was released in 1982 and as such the special effects are kept really basic which today makes it seem so much more realistic. The temptation of using fancy and silly computer graphics has been repressed and instead we get a solid sombre dystopian sci-fi movie that even today has a good level of special effects. Well done! If you have a movie taste anything similar to mine this is without a doubt a must-see. It is not perfect in any way, but in my opinion it is a cornerstone is the sci-fi genre and especially regarding androids. Enjoy another Ridley Scott masterpiece.